Millions See 1960’s Concert Poster Exhibit ! Last week we discussed the Bill Graham Exhibit which is currently appearing at the Skirball Cultural Center in Los Angeles, Ca.. Once again, we implore you to go see it, it will exceed your expectations. 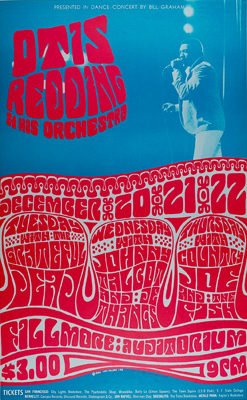 This week I would like to tell you about another major exhibit that brought 1960’s Concert Posters into the mainstream consciousness. 1) The exhibit was truly massive, and professionally executed. Kudos to the curator, Ben Marks and all those involved in this project in any way. 2) These amazing posters, when displayed side by side, provide an overwhelming feast for the eyes! 3) Literally MILLIONS of people saw this exhibit. 4) Most people we talked to that were viewing the exhibit were BLOWN AWAY by the art, and many asked where these posters could be found, and of course, how much are they worth? 5) These posters DO have widespread, mainstream appeal. It’s simply a question of exposing this exciting collectible and artwork to the general public. That’s the hard part. The desirability and appeal of these artworks sell themselves once seen. 6) The Internet does not do these posters justice. These posters MUST be seen in person to be truly appreciated. A one inch thumbnail provides less than 5% of experiencing the real thing. Even blown up pictures on a large monitor fail to scrape the surface of the true experience of viewing these posters firsthand. That’s why it’s so encouraging to see these posters make their way into art galleries and museums, it truly is love at first sight. 7) Take a look at the wonderful article on this exhibit. Not only does it provide a fabulous overview of the posters, it also shows you through several photos how impressive this exhibit was! To see the article, click here!